I've written a script which merges old or inactive customers, vendors, or items into one record. All of the details of the sale are retained, but the customer information from the customer information screen (credit card, phone number, email) is lost. There is NO impact whatsoever on financial data. The customer address is retained because it was on the sales receipt or invoice. The down side: if you need to look up a receipt for an old customer, you'll have to have his invoice number... or keep a backup file in a separate company. It's not bulletproof. A few people have reported problems that I've been able to solve. The script will NOT work if most of your customers have jobs or estimates. It will work if you have a few customers that each have hundreds of jobs or estimates. I also have a version that Merges Vendors and Inventory Items if you have thousands of those. Before using the script, you may need to make older customers inactive. You can do this by exporting lists into Excel and using the formula provided in the Sample Spreadsheet. -- or I can do it for you at additional charge. The customer script costs $75.00, items and vendor scripts are more expensive. No charge if it doesn't work for you. Order and pay by credit card through paypal. Within minutes you'll be emailed a download key and you'll be able to download the program. Reach me at The Energy Grid at (888) 310-4523. 1. Get a new accounting Accounting System (Not recommended). 1. 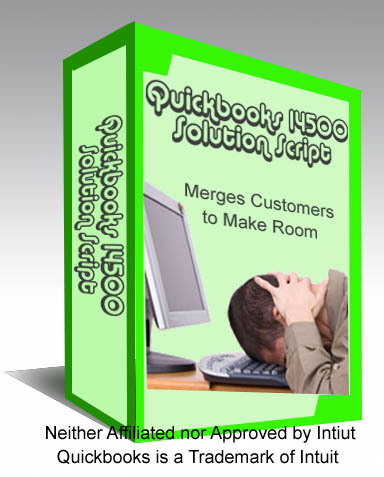 Upgrade Quickbooks to the Enterprise version (costs around $3,000).